At the risk of discrediting myself, I have developed something of a sweet tooth when it comes to books. I can’t resist a good love story. For example, I read – and yes, I really enjoyed – One Day. Give me a book that’s the literary equivalent of a John Hughes movie and I can’t resist. It’s a wonder my shelves aren’t overrun with them, confections jacketed in soft shades of red and white and, yes, pink. But every so often, instead of something sweet I find myself craving something harsh and bitter, the literary equivalent of some throat-burning spirit the cowardly choke down as fast as possible and the brave savor even as their eyes water. Willard eased himself down on the high side of the log and motioned for his son to kneel beside him in the dead, soggy leaves. Unless he had whiskey running through his veins, Willard came to the clearing every morning and evening to talk to God. Arvin didn’t know which was worse, the drinking or the praying. As far back as he could remember, it seemed his father had fought the Devil all the time. Arvin shivered a little with the damp, pulled his coat tighter. He wished he were still in bed. Even school, with all its miseries, was better than this, but it was a Saturday and there was no way to get around it. 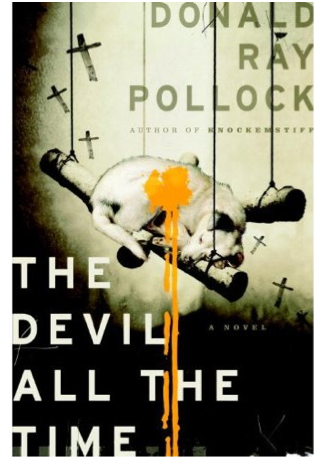 It’s been a while since I’ve come across a title as fitting as The Devil All the Time. In this book, the first novel by Appalachian author Donald Ray Pollock, there’s something wicked going on all the time, and I mean all the time. Every character seems twisted in some way, and the few relative innocents are usually destined for a bad end. The flap copy draws parallels to both Natural Born Killers and Flannery O’Connor, and both comparisons are well-earned. The story spans over twenty years in Christ-haunted Appalachia, industrial towns in southern Ohio and West Virginia where people scrape out a living by day and indulge their vices by night or else lose themselves in that old-time religion. There is a husband-and-wife serial killer team going on murderous road trips, picking up hitchhiking men to sexually torture and mutilate. There’s a pair of charlatan preachers – one of whom dumps buckets of live spiders over his head while his crippled partner plays guitar – with just enough faith to get themselves into very, very serious trouble. There’s a corrupt sherriff and a fat landlord whose wife sleeps with half the men in town. And in the middle of it, there’s Arvin Russell, growing up with his shell-shocked father Willard and beautiful mother Charlotte. In just the first of a long series of shocks Pollock delivers, Charlotte is stricken with an aggressive cancer at thirty. Willard, driven mad by the possibility of losing her, forces his son to pray with him day and night, wailing at his prayer log. When it doesn’t seem to be working, Willard reaches back to an older tradition than prayer – blood sacrifice, slaughtering animals and hanging their corpses so the blood drains over the log while father and son pray. The ground around the log stayed muddy with blood. The number of insects swarming around them multiplied every day. Both were covered with bites from the flies and mosquitoes and fleas. Despite it being July, Arvin took to wearing a long-sleeved flannel shirt and a pair of work gloves and a handkerchief over his face. Neither of them bathed anymore. They lived on lunch meat and crackers bought at Maude’s store. Willard’s eyes grew hard and wild, and it seemed to his son that his matted beard turned gray almost overnight. “No, sir,” the boy said. Arvin pulled the filthy handkerchief from his face and breathed deeply of the rot. From then on, he quit trying to avoid the mess, the endless prayers, the spoiled blood, the rotten carcasses. But still, his mother kept fading. Everything smelled of death now, even the hallway leading back to her sickroom. Willard started locking her door, told Arvin not to disturb her. “She needs her rest,” he said. Nick Hornby, this ain’t. Instead it’s a story so gritty you could sand a table with it. It’s something like an Appalachian Last Exit to Brooklyn in its stern, hellish vision, but sometimes Pollock also displays a Tarantino-like sense of sick humor, such as when serial killers Carl and Sandy discover that their newest victim, who had claimed to be penniless, had three hundred dollars hidden in his bag, Carl observes, “Them goddamn redheads…. Hell, they’ll spit out a lie even when the truth fits better. They just can’t help it. It’s something got fucked up in their evolution.” He has a great knack for pointing out the thing in the scene at which you shouldn’t laugh but can’t help yourself once you’ve seen it. The level of violence is almost unrelenting. It’s easily the most violent book I’ve read since Blood Meridian and the most gleefully violent I’ve read perhaps ever. When Pollock wants to vault over the top, it usually means somebody is going to be choking on their own blood by the end of the scene. He racks up a high body count over the course of the story, and even though there are times when it’s tough to keep going, the story is so compelling and so – God help me – entertainingly told that it flies toward its violent, satisfying conclusion, assuming the whole business with the prayer log didn’t make you put it down in chapter 5. If you’re in the mood for something strong, some hard-to-take but powerful medicine, The Devil All the Time might be the book for you.